I get it. When you’re the biggest car manufacturer in the world and there’s a motor show on your home turf, you have to show everyone that you can innovate and are leading the pack with future technologies. And that’s what Toyota did at this year’s Tokyo Motor Show, but it leaves us with one glaring omission we’re all talking about. I understand why Toyota would need to show several fuel-cell vehicles, a technology that they are still committed in just like Honda, BMW Mercedes, as well as several autonomous cars dabbling in artificial intelligence and new forms of connectivity. Toyota even said that by 2020 all new cars sold in Japan will be able to connect to their “cloud” for over-the-air updates on software, as well as sharing information from car to car. It’s all very clever—but where’s the new Toyota Supra? You know, the one that’s been running around in camouflage so long now that it feels like it’s due for its own mid-cycle refresh soon. Surely the Tokyo Motor Show, the premier motoring show in Japan that only happens every two years, is the ideal place to show or even talk about the return of an iconic sports car model. You’d think so! But that’s not what happened. I’m not sure who’s to blame here. Perhaps our expectations were too high? Maybe we all jumped the gun a little bit. But when a test mule of the new Supra is spotted driving on the motorways in Tokyo just weeks before the Motor Show it’s hard to not get hyped about it. Plus, this wasn’t something as farfetched as a new Mazda rotary or a reborn Nissan Z—this is an actual car that we know exists. So why not show it off already? Maybe Toyota just didn’t think it was important enough bring to the show. There was not even a mention of it in their press conference. It would have been perfect for Toyota to show that, and its autonomous and high-tech future. What a way to prepare for the future and say that passion still matters. If we’re to believe Toyota’s commitment to making cars fun again, showing the new Supra in one form or another would be a good start. Hell, even showing the FT-1 Concept from three years ago (THREE!!!) at the show would’ve been a good enough tease. Toyota was the first press conference of the day at the Tokyo Motor Show and it’s safe to assume a few people there were expecting to see the new Supra in one form or another. Even Toyota mentioning something about it briefly would’ve sufficed. Instead, the disappointment at Toyota set the mood for the rest of the show. Okay, maybe that’s a bit much. The rest of the cars they had at their stand were pretty cool. The new Toyota Century was the highlight for me. The company’s flagship sedan has gotten its first major update in 20 years. It’s only the third generation in the model’s 50-year history. Ditching the prehistoric V12 engine for a more eco-friendly V8 hybrid setup, the Century is still a discreetly opulent limo. It’s perfect for the politician that doesn’t want to look corrupt or the businessman that doesn’t want to show off their success. It’s very Japanese in that way. The interior was something else. Whereas most ‘luxury’ cars these days only have leather seats, the Century comes with wool seats as standard. Why wool? Because why not. Leather is an option, but why bother? Obviously the Century is a car for rear passengers so its no surprise rear legroom was generous. There was more space in the back of the Century than most apartments in Tokyo. The front wasn’t too bad either, it now comes with technology from this century. There’s also the new Crown “Concept,” but it’s about as production ready as a concept car can be. Next to the Century was the odd Gazoo Racing HV Sports Concept. 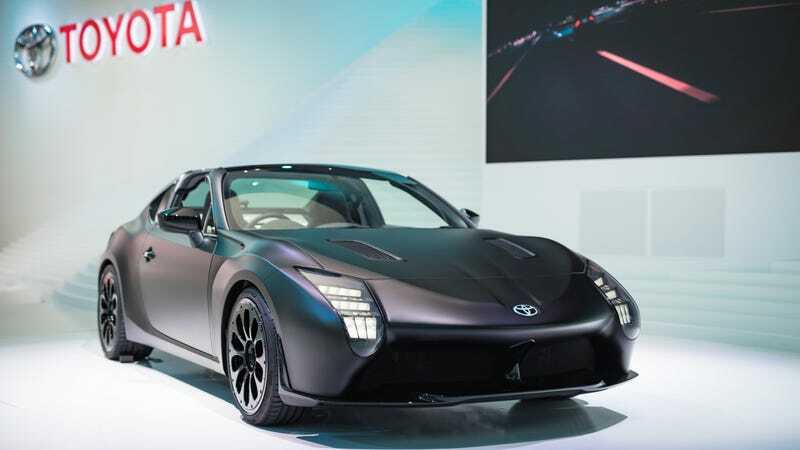 Basically a Toyota 86 with a Blade Runner-style bodykit and a targa-top roof. This was the token sports car for the show to make up for not having a Supra. It does have a trick gearbox where it’s an automatic but manual mode is operated via a gear stick rather than paddle shifters. It’s something I’d want to try myself. I think it’s unlikely Toyota will ever actually make this thing, but it was intriguing. Unsurprisingly Toyota had the biggest stand at the show. The entire west hall was taken up by Toyota and Daihatsu (also owned by Toyota). The Fine-Comfort Ride FCV Concept is an autonomous fuel-cell vehicle benchmarked against the S-Class for ride comfort, while the autonomous i-Ride Concept was literally crying for help. I know how it felt. Toyota recently launched its new “Start Your Impossible” tagline, but I’m beginning to wonder if ever seeing the damn Supra is what’s actually impossible here. But at least there’s the 210 horsepower Yaris GRMN to be happy about in the meantime.